By Sara Moon, Sheffield and District Reform Jewish Community Development Worker and an organic food grower. I love Judaism for how it embodies what could often be considered poetic metaphor. I also despise it for the same reason. I was averse to creating a Sukkot ritual with plants from so far away. Sukkot is about gathering in the harvest! To taking from local plants that are abundant and local! Surely it is not, I persisted, about shlepping bits of trees thousands of miles in airplanes, and drenching them in chemicals to ensure they are ‘perfect’. On the first day of the recent ‘Sukkot Sheffield’ retreat Yael and I ran a workshop on the 4 species, examining the texts that command us to gather these plants and exploring the environmental impacts this practice can have today. We share a personal conversation that we have been exploring together since the beginning of Sukkot when Yael shook her beautiful imported lulav and etrog and I squirmed, thinking of the unholiness (nasty chemicals and the waste of all those with ‘blemishes’) that goes into producing such perfect etrogim and also the connotations it evokes – that we are always longing for a place we are not. On the great Jewish nature connection festival why bury our noses in these foreign species, why not connect to where we actually are? Why is God not found in our abundant apple trees, oak, pine? 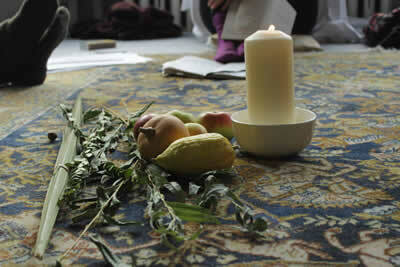 I share this with Yael who shares her experiences of the sensation of opening the etrog box every year, that same smell that comes flooding back, the dimensions of the lulav, the familiarity of the long spine of the palm, the myrtle, the willow…imagining a group of people who for a long time have brought these species together at the heart – as an ancient thread of ritual. Through this practice we touch a slice of the ancient and eternal! I soften at such a thought. A day after the retreat I continue to sit quietly with my two-part lulav and etrog, riding the poetry of both the ancient/imported and the freshly and locally foraged. In one hand both the tall strands of the promised land; the spine of the date palm, the sturdy and sweet smelling myrtle, the windblown willow besides the freshly foraged specimens of a nearer land; pine, oak and willow. In the other hand, a bumpy yellow fruit called an etrog and a small apple plucked from a nearby tree smelling as deeply apple as an etrog does etrog. Holding in my hands a piece of the promised land, a symbol not of any nation state, but of a state of being, a state of this planet, a piece of the promised land, of a future that shines in peace, justice and a regenerative ecological culture where humans are at one with the land. I shake my whole body along with my hands. I shake this curious combination of here and there; ‘diaspora’ and ‘zion’, noticing the resistance I feel to connecting with the imported and intensively farmed plants and the familiar love I feel for the oak and the apple. Breathing through this, I notice another layer that rises from the quiet. The thread of ancient that whispers through this ritual, through the textures of these distinctive species. Childhood Sukkots leap to mind, centuries of debate and struggle to find these plants to fulfil this commandment. I cannot help it, the long spines of the palm tree lure me back across ancient time; I forget the gruesome politics of the place it was grown and think of the soil that grew it, contested, beautiful, far. I remember the freshly harvested dates I ate at Kibbutz Neot Smadar in the Negev this August, that personal inescapable love of that land. And I breathe in past the literal, to a deeper meaning – that we can long long long for another world, for a promised land, that we can even hold in our hands the pieces of that place, an elaborate embodied metaphor. We can hold it against our hearts, our etrog, praying it will be, that redemption will come and we will live in the promised land of our dreams. And at the same time, I stroke the curves of the oak leaf, humble plant ancestor of these Isles and I ache for the beauty and wisdom and richness of the land I live and love on. I breathe in the perfection of now, the being where we are, the dazzling surety of the ground beneath our feet, even as we dream for it to be better. (This feels particularly true as an activist always longing and fighting for a better world though at the same time, essentially, for both mental and spiritual health living in huge gratitude for the beauty and treasure that already exists in abundance on this planet). May we trust these lands we live on, may we make time to connect to their natural treasures, to hold them in our arms, to smell them. And may we never give up on the promise of a better world, the smell of redemption singing like an organic etrog grown at last in unoccupied and peaceful conditions.